Moving away from a life based in energy consumption, a life based in slavery to survive, a life dependant on technology, and consumer goods is what will pave the way for our children, sacrifice will give them a chance. We are now as a species beyond the point of no return and we must work fast and hard to create a sustainable way of life that has a future free from the boot of the oppressor and the accompanying ecocide! Struggling with ego, and sense of self is one of most difficult tasks you can undertake as someone who feels compelled to enter into the realm of resistance, or revolution, is your ego getting in the way of the greater good? Is staying in the center of the organizing and the public praise that comes with it hard to give up? These are all things that must be examined, so that learning and growth can take place, it is hard and painful to confront yourself honestly, but it is rewarding and the insight is a gift. No one can tell you what to do, or make you do anything, this rite of passage in your growth as someone who would fight for our collective future and for Mother Earth is essential, this is a choice, a life style, a sacrifice, this is not a trend, a fad, or a fleeting moment of whimsey. For these reasons the desire to reach outside of yourself and look into your spirit must be your own, the change must be inspired by self and spirit. We all have our faults and our weak spots and this is why building a community of like minded people is important, so we can help each other, so we can support each other like the individual cells of a whole organism. 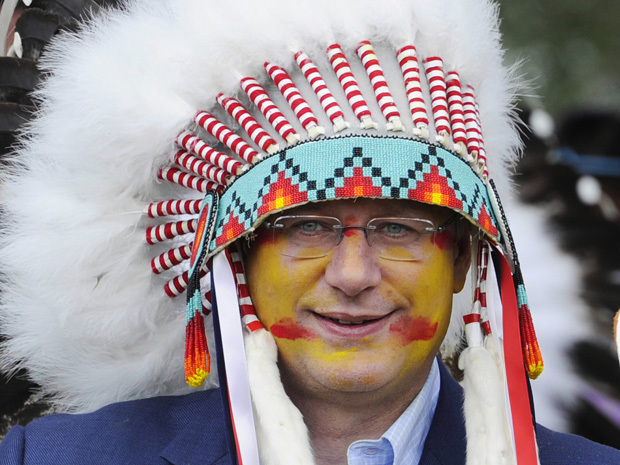 Posted on April 13, 2014, in Decolonization and tagged Ancestral Pride, Canadian colonization, Stephen Harper. Bookmark the permalink. 3 Comments. You’ve made some good points here. Interesting reading. Canada is not a legal country, it is a state, legal workers call it State of Canada. The First Nation people own the land. People, always tell Harper that we own the land. This is what I am hearing.